It took awhile and many proposals, but by the 1920s the city had a number of locations under consideration for additional comfort stations. However, as soon as the locations were announced protests began. Former mayor L.D. Taylor issued a writ to protest the construction of the Georgia and Howe station, and was joined by complaints from the Law Society and the provincial and federal ministers of public works. The provincial government even threatened legal action to prevent the construction. Their gripe was that a public loo was inappropriate so near an important public building such as a court house. Protests and complaints also delayed construction on the Hamilton and Hastings location and the federal government once again got involved protesting the proposed post office location. Even the library board and the automobile association felt the need to weigh in on the issue. Eventually, Council decided to push forward with the Georgia and Howe, Hamilton and Hastings, and Main and Hastings locations, dropping three other contentious locations. Arthur Julius Bird, the city’s building inspector and an architect, got the job of designing the loos. Their above ground presence was confined to elaborate cast iron railings. The Georgia and Howe location was demolished in the 1960s, while the remaining two were renovated. 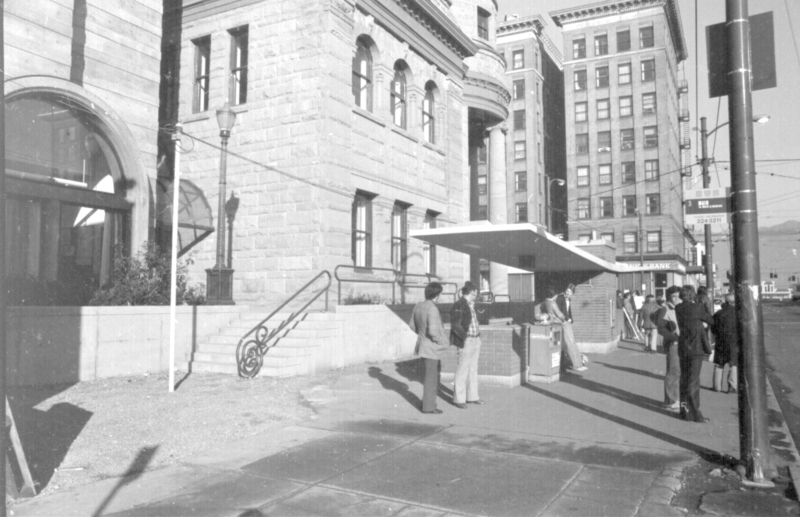 Main and Hastings was redesigned above ground with a striking modern concrete canopy that soared over the entrances, providing an interesting counterpoint to the rusticated stone facade of the 1903 Carnegie Library. Sadly, this was demolished in the early 2000s as part of a redo of the space around the Carnegie Centre and replaced with railings and gates that sort of recall the restroom’s original form. Next Post There It Is… insulCrete!